Water passes through a Column of ion exchange resin that captures ions such as Calcium and Magnesium (hardness), as well as a limited amount of Iron. When the resin is saturated with the contaminants, it needs to be cleaned. The process starts with adding soft water to the brine tank to make the brine cleaning solution several hours before the regeneration begins to prevent caking up the salt. It then backwashes the resin to remove any sediment that was trapped by the filter, then a brine solution passes up through the resin to clean off the hardness that was trapped, flushing it away. The control then rapidly rinses the resin to remove any residuals, and returns to service. This process occurs in the middle of the night or when water use is low. S&G also carries ion specific resins that can remove high concentrations of Iron, Arsenic,Nitrates and other contaminants. 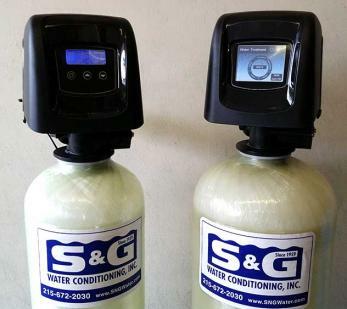 ​ Our digital metered control head counts the number of gallons of water treated. We calculate the unit capacity when we design the system. When the meter reaches zero, the unit will regenerate the next time it is 2 AM. If demand is heavy, the system regenerates more frequently. Conversely if the water demand is low, the system will delay regeneration, until the capacity has been reached. This works very well for families that change in size (visitation, college, etc. ), travel frequently, or have hectic schedules that prevent you from following a set laundry schedule. Variable reserve capacity & brining, based on your water use history. 2 relay outputs and a remote regeneration input for specialty applications. Our award winning alternating control is the most efficient system in the industry. 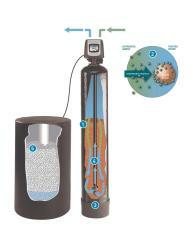 The package consists of twin filter media tanks with a central metered controller. One tank is on line at any given time. When the meter indicates that a tank is exhausted it switches to the opposite tank, and regenerates the exhausted tank with treated water, then places it on standby. This eliminates the need for any reserve capacity, required for timered or metered systems. 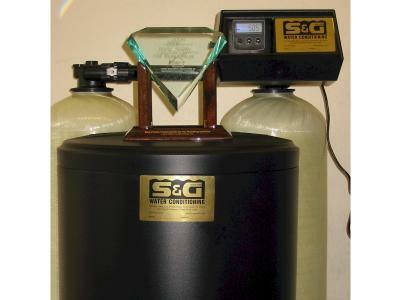 It provides a continuous supply of treated water without any interruption for regenerations. Ideal for boilers and cooling towers. This is an ideal solution for wells with high contaminant levels. Many of these wells produce very dirty water making it very difficult to properly clean a single tank system. Since the alternating system cleans with treated water, we can provide a much better regeneration and higher quality product water.